The most important and must-attend commercial and package printing event in the Middle East and North African (Mena) region. The event promises to offer advanced presentations on marine engineering, offshore technology, engineering and communication and naval architecture sectors. The Middle East Pharma Cold Chain Congress will address the challenges faced by the cold chain industry in the Middle East and North African (Mena) region and their solutions, the establishment of quality distribution and risk management process. Forum in Dubai for education, corporate training and career development in the Middle East is held twice a year. Gulf Construction Expo is held annually in conjunction with two other major events - the Gulf Property Show and Interiors Expo - thus providing the biggest integrated business-to-business showcase for the construction, interiors and property sectors ever to be staged in the Northern Gulf. International plastics, rubber, petrochemicals, chemicals, fertilisers, plastics recycling, printing and packaging industry exhibition and conference. International exhibition for windows, doors, glass, aluminium systems. International exhibition for steel structures, tube and pipe, sheet metal, metal forming and steel fabrication. 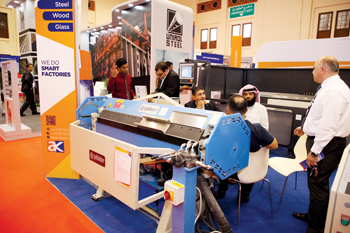 Metal and Steel Saudi Arabia is recognised as the fastest growing steel, steel fabrication and metallurgy event in the GCC region. China Trade Week - KSA is an essential opportunity for business owners, professional buyers, wholesalers or import /export organisations who are seeking new sources for their products and services. Gulf International Industry Fair will cover key industrial sectors including aluminum, metal production & works, energy, and power generation, manufacturing, production and logistics. More than 60 companies from China will showcase their latest offerings at the event which is being organised on behalf of Silk Road Steps Committee in China by Beijing Sea Level Science and Technology Company, over a 8,000 sq m area. An annual International construction technology and building materials show. An annual international trade exhibition for food products, ingredients and technologies.